Let’s paint you a picture. Winter is fast approaching and bringing with it jaw-shatteringly frigid temperatures occasioned by sometimes frequent blizzards of snow and whatnots. Dismantling the central conditioning system for outdoor use is out of the question. As an outdoor enthusiast with a deep love for bonfires, or a professional landscaper out to make a quick buck, you’re left with two choices: buying a log splitter or sticking to your beloved axe or maul. But here’s the problem. The axe is no match for the convenience, smooth and powerful performance, durability and practicality of a log splitter. Next to a standard log splitter, an axe or maul looks like a dangerous child’s play toy. Plus, it comes with several downsides. Splitting logs with an axe is an onerous, labour-intensive, time-consuming and back-breaking exercise that aside from building character, does nothing to else to speed up the process. Plus, it puts you at great risk of harming yourself in case you miss your target. Compare this to the practicality, ease of use, versatility, convenience, and safety of using a log splitter. And it’s not like they are in short supply. The market is booming with all types of hydraulic, electric and engine-powered models whose design introduces a much-needed comfort, ease, and speed into the process of splitting wood. As an individual, you have total discretion of choosing a log splitter that you fancy. Before making that decision, though, keep in mind that there are several models out there and each one is optimized for handling particular types of woods. In the next section, we highlight the important factors to take into consideration, so you end up with exactly the log splitter you need. Users looking for a taste of the premium features while working on a budget should consider the Snow Joe Sun Joe LJ10M. Obviously, you'll be foregoing several time and energy saving features, but in return, you get untamed, raw strength for splitting different woods and logs in a split second and with unmatched precision. It combines manual arm strength and hydraulic power to handle logs that are up to 18-inches in length. It might sound difficult to use but itr only requires minimal effort input. Through its hydraulic ram system, the log splitter effortlessly provides the user with up to 10 tons of force, meaning that you'll be splitting some of the toughest logs of wood quickly and with minimal effort. You'll, however, have to resort to the conventional hand axe in case you have those small, straight strained and simple logs to split. The LJ10M comes with several unique selling points. However, the one that stands out most prominently, aside from the effortless and hassle-free performance, is the construction quality. 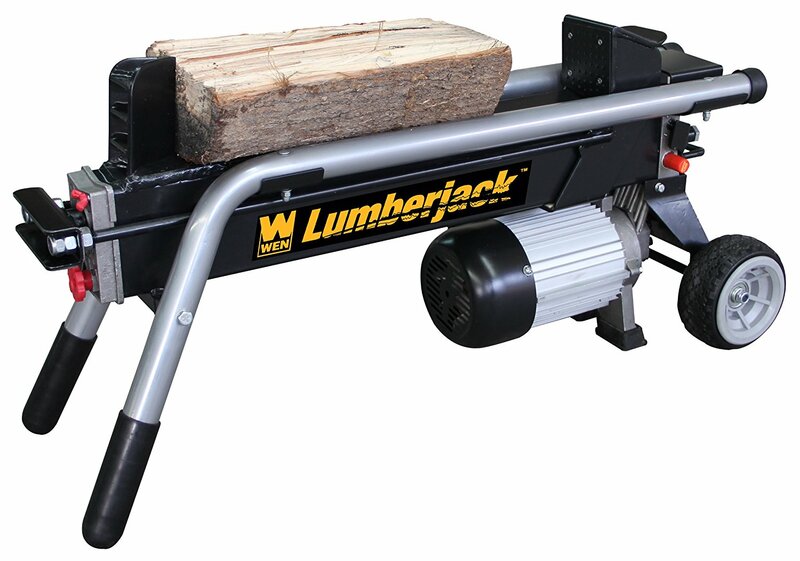 Unlike the vast majority of off-brand, cheap log splitters on the market, the perfectly balances high-quality construction, incredible performance, and ease of use to ensure the user has an easy and trouble-free experience undertaking an otherwise onerous and physically demanding exercise. The rugged construction of the splitter using industrial-grade steel means that it is capable of gracefully standing up to rigorous, outdoor splitting of the toughest, gnarliest and most knotted logs every year. And in the off-chance you encounter any performance issues either because of the manufacturer's use of defective components or low-quality materials or poor manufacturing, you can use the provided 24-month warranty. As for performance, it is no slouch in spite of being a manual model. 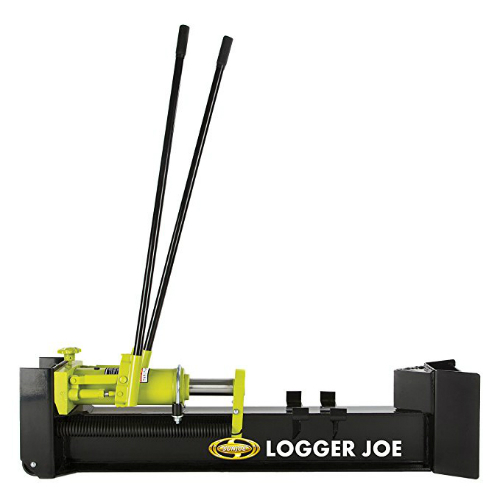 It is the undisputed king of other manual log splitters, with just a small fraction having the ability to hold the candle up to it. It is a perfect choice for users with a big appetite for raw power for making quick and short work of the toughest and most demanding projects. Harnessing its immense power provides for the easy and reliable generation of up to 10 tons of driving force that enables you to split firewood logs easily and quickly. 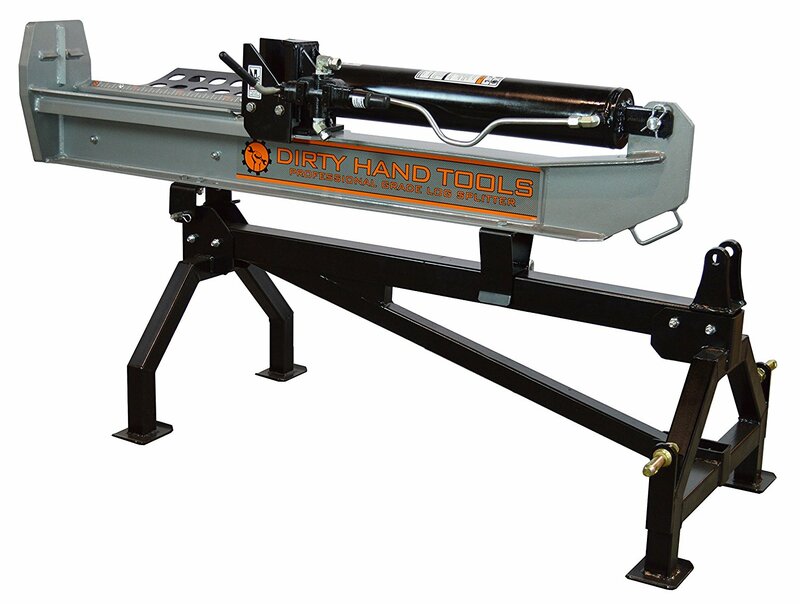 The machine, in light of its sturdy and rugged construction, easily accommodates logs that are up to 18 inches and 8 inches in length and width. However thick knotted and gnarly the logs are, the log splitter will make short and quick work of it, thanks to its high-performance hydraulic ram that’s capable of building a maximum of 10 tons of force. Unlike battery-powered, electric and gas-powered log splitters, using it is a complete breeze; you don’t have to put up with the downsides that are typical of the three. For one, the log split has variable pressure feature. Hence, you can choose the most suitable pressure setting in accordance with the type of wood you intend to split. For the tough, knotted and gnarly logs, the higher pressure will suffice. A low-pressure setting, on the other hand, will more suitable for small, straight strained and simple pieces. Secondly, there is the strategically located cradle that conveniently catches the split pieces before they hit the ground, thereby saving you the trouble of bending down all the time to pick them from the ground. Being a manual model, it spares you the headache of storing and mixing oil and gas, of dragging a power cord in the case of electric models or of constantly worrying about battery juice running out. In addition to the already mentioned convenience features, the Snow Joe Sun Joe LJ10M similarly is lightweight and compact and has these sturdy wheels that make it sufficiently manoeuvrable. Consequently, you have a portable machine you can easily move from one place to another rather than risk throwing your back out carrying heavy logs to where it is. There is also the time-saving piston rod that provides for quick resetting of the ram return spring. Lastly, it sports long handles to give you absolute leverage when splitting different types of logs around the yard. The Boss Industrial ES7T20 Electric splitter is yet another popular choice for both domestic and commercial applications. It perfectly combines robust and rugged construction, jaw-dropping performance, and ease of use to give the user the best value for their money. The machine packs a high-performance, smoothly running and long-lasting 2 HP motor for an efficient, quick and effortless performance. The splitter easily generates up to 7 tons of splitting force that makes short and quick work of both softwoods and hardwoods that are up to 20.5 inches in length and 10-inches in diameter. To keep you safe and in one piece during splitting, it incorporates the useful and time-saving automatic ram return and allows for stress-free one-handed operation. Plus, there is a sturdy 7-inch wedge featuring an all-steel construction. Bring all these features together, and you'll understand why you'll have to dig a little deeper into your pockets to afford it. In our in-depth review, we'll begin with its outstanding performance. Is the log splitter the most cost-effective, lightest and most powerful machine in the industry? Definitely not. However, it is a multi-functional unit that brings together different these qualities so that it can effectively handle a wide range of applications. Like indicated earlier, it packs an immensely powerful, reliable and yet easy to maintain 13.5-amp, 2 horsepower motor running on 1500 watts. To this add, the machine's cutting capacity of up to 20.5 inches in length and 10 inches in diameter. Some log splitters on this list that will struggle to go through freshly cut logs with tough knots and gnarls. The ES7T20 does not belong to that group. It handles green logs with envious ease and speed. As was the case with performance, it is also very easy to use. There are a few attendant downsides here and there but let’s begin with the positives. 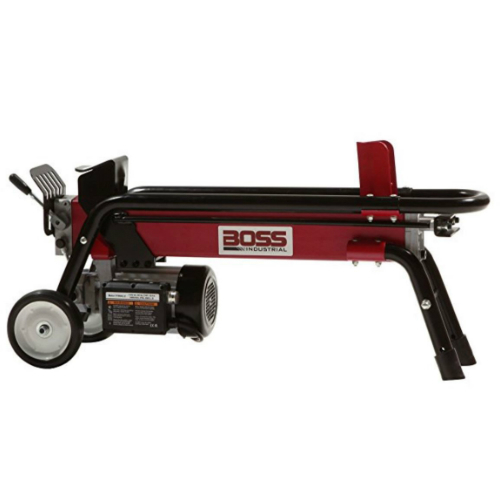 With this log splitter, Boss Industrial effectively demonstrates its ability to take a machine that already a cinch to use, and simplify it further for seasoned and greenhorn users. You can operate it with just a single hand, which then frees the other hand for other equally important activities. Secondly, the machine comes with a ram that resets itself automatically after every splitting task that you do. Over time, such convenience translates to significant savings on time and effort, allowing you finish splitting piles of logs in a fraction of the time it takes a log splitter lacking the feature. A second convenience feature is the lightweight design of the log splitter. It weighs some 106 pounds with corresponding dimensions of 40 inches by 13 inches by 20.5 inches. With such dimensions, carrying it, even if you have an extra pair of hands to help, is not an option. Luckily, it sports two sturdy, all-terrain wheels to provide for easy and quick transportation and portability around the yard or garden. It also has an ergonomic and snug handle that allows for quick and effortless manoeuvrability while minimizing hand fatigue and strain. Additionally, it comes with an inbuilt side rail that ensures the logs remain steady all through the cutting process. Being an electric model, you can choose to use it either indoors or outdoors. In the latter case though, you’re going to have to use an extension cord whose length will depend on how far from the house you want to work. Unlike gas-powered log splitters, the machine does not produce any toxic fumes and is therefore not a danger to the health of the house occupants nor the environment. The downsides of the wood splitter are not that glaring, and in our opinion, they don't significantly affect overall performance. First off, it has a low profile design to help you load logs easily and quickly. However, without its stands, you'll be forced to bend down to start your project, and this can be a serious problem if you have back problems. Also, some users have noticed a slight oil leakage from the hydraulic ram so you need to keep an eye on that, though you can quickly rectify the problem by replacing the O-rings. These drawbacks are nothing compared to the labour-intensive, time-consuming and back-breaking work the user has to endure when using an axe. For the ultimate, trouble-free and stress-free performance, we highly recommend the Boss Industrial ES7T20. Using the log splitter is a cinch as it features a user-friendly design that both seasoned log splitters and novices will relish using. It offers the user one-handed operation, an automatically returning ram, a splitting force of up to 7 tons, and a reasonable price tag. It is, without a doubt, one of the best electric log splitters you can get at its price range. The Powerhouse XM-380 is an actual workhorse that stacks up pretty strongly against our first choice both regarding performance and ease of use. While it's a powerful model that comes with all the bells and whistles, you may want to ensure you get a fully functional model as there are a few bad apples out there whose unreliability and unpredictability in quality of construction and sturdiness can mistakenly be extrapolated to the entire Powerhouse market. Overall, the XM-380 is an incredibly powerful machine capable of accommodating logs up to 20.5-inches in length and 12-inches in width, meaning that it's accommodative of bigger log sizes than our favourite choice. The design and engineering of the log splitter aim to keep the user safe and in one peace during their splitting project. One feature that ensures this is the two-handed design. Its performance is without a doubt exceptional. The machine packs a powerful 3 HP, 7 Ton motor that runs efficiently and smoothly at 2500-Watts and impressive speeds of up to 3,500 rotations per minute. That's one of the most powerful motors and fastest speeds you'll encounter in the industry, and it easily translates to effortless splitting and quick completion time. Couple that with its ability to cut logs that are up 20.5-inches long and 12-inches wide and you have a machine you can use confidently and comfortably to split even the largest and most dense logs you can find in your yard. Even more remarkable is the fact that it offers the user a rum travel distance of 15.7 inches that pairs perfectly with its 7-ton splitting power. The preference for the Powerhouse XM-380 among the vast majority of professional landscapers, homeowners and even enthusiastic DIYers is also informed with the ease of running and maintaining it. The powerful 3 HP motor requires little to no maintenance at all, and it starts almost instantly, with minimal fuss and hassle. Being electric you'll never have to worry about running out of gas or pollute the environment with toxic fumes or have to pull at a cord tirelessly to get the engine running on cold days. Since it does not use any batteries either, there is no risk of battery juice running out in the middle of an operation, forcing you to take a break as it recharges. You'll, however, have to drag along a power cord with you as you work and there is the risk of it getting constantly tangled around the logs and therefore limiting your mobility. As you would expect, using it is quite a cinch. The ergonomic design of the handles, for instance, endeavours to spare your arms, neck, and back from any aches that may result from splitting logs for several hours every day, in the case of professional splitters. Also, there is no chance you'll be using it for several hours every day as it is capable of splitting more than 100 tough and hard logs each hour in an effortless and quick fashion. It is also relatively lightweight and compact at just 104 pounds and sports heavy-duty and durable wheels for easy transportation from one place to another by towing or otherwise. In the same breath, chances of injuring yourself while using it are literally non-existent, that is if you follow all the safety measures to the letter. You won’t be needing any axes, so obviously there is no way of missing your target. Nevertheless, the log splitter features an intelligent technology that makes it retract automatically if the user removes decides to withdraw one hand from the lever. Other than keeping you safe, the safety design also allows for effortless and quick loading of heavy and bulky logs. The need to operate it simultaneously with both hands significantly minimizes personal injury if you don’t have an extra pair of hands to help with the work. For quick, effortless and safe splitting of highly knotted woods and logs, we recommend you seriously consider the Powerhouse XM-380. It comes with a host of remarkable safety, performance, and convenience features that together put the cycle time at an impressive 5/6-seconds, the cutting capacity at 20.5-inches and 12-inches in length and width, respectively. It's also easy to use, which translates to significantly less headache and back pain. In all, the reliability, consistency, durability, and ease of using it make it hard to pass up. To say the Champion splitter with auto return is impressive in its performance and it’s a cinch to use is clearly an understatement. For starters, the machine has a maximum log size of 19.5-inches and has an impressive cycle time of 20 seconds. Nevertheless, the log splitter does not hold the candle to some cheap, off-brand models out there in terms of features and specs. What the log splitter cedes in specs and features it more than makes up for in power. The machine boasts an unmatched prowess for splitting, rather effortlessly and quickly, some of the hardest woods and heaviest logs you can throw in its path, thanks partly to a high-performance 80cc gas-powered engine. It also comes with a practical and easy-to-use low-to-the-ground design that makes using it a cinch. Users with lots of cords of hard, knotty logs to split will immediately fall in love with the power and performance of it. 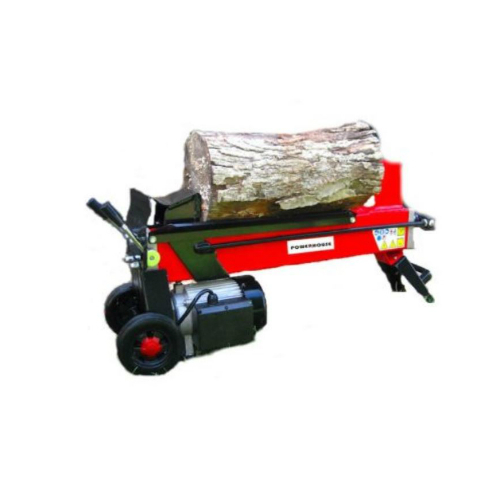 The wood splitter delivers an incredible amount of power, a fact that users wholly attribute to its 80cc engine. Even then, expect it to struggle to split those particularly large and thick logs you have lying around. For normal, everyday splitting tasks that involve woods like ash and pine, it’s performance is always exemplary. Users who like trouble-free and straightforward performance will appreciate the efficiency of the log splitter, seeing as it automatically adjusts the level and flow of pressure in accordance with the position of the log in the machine. Unlike cheaper, off-brand models, it only applies optimal pressure if it detects that the alignment of the wood is correct. The design makes it energy and fuel-efficient choice and therefore an ideal choice for users working on a budget or looking to conserve their resources while getting the best performance possible. Ideally, you should get the motor oil and hydraulic fluid in advance so that you can start splitting logs literally the next second after assembling and fine-tuning the machine. Yes, that's right; the Champion splitter does not come pre-assembled. Its low profile design additionally increases usability and practicality and ensures you don't break a sweat while splitting logs. The design makes it easy to load heavy logs as it eliminates the need to carry them far up in the air, which would put senior citizens at great risk of throwing their back out. However, you'll still have to contend with having to bend whenever you're thinking of splitting wood, albeit not as much as you would if the wood splitter has a high profile. Like the top-end model that it is, it does come with a factory-installed log cradle that helps significantly with keeping the pieces in position which in turn minimizes the extent to which you'll be bending over. Assembling a log splitter is a relatively easy and straightforward endeavour for mechanics and other seasoned log splitters. However, it might be daunting for greenhorns encountering one on their own for the first time. Another downside of the Champion is transportation process. The machine weighs nearly 150 pounds, meaning that the only way of getting it to the site is either fitting it on the back of a truck bed – quite a daunting process if you ask me – or towing it on the back of your truck. The latter option is apparently easier, especially considering that the machine comes with remarkably sturdy 10-inch wheels to make transportation quick and easy, however uneven the terrain is. This option is a solid and wise investment for users looking to tear through numerous cords of hard and large logs every year. The machine comfortably and easily handles anything with a length and weight of up to 19.5-inches and 50 pounds, respectively. 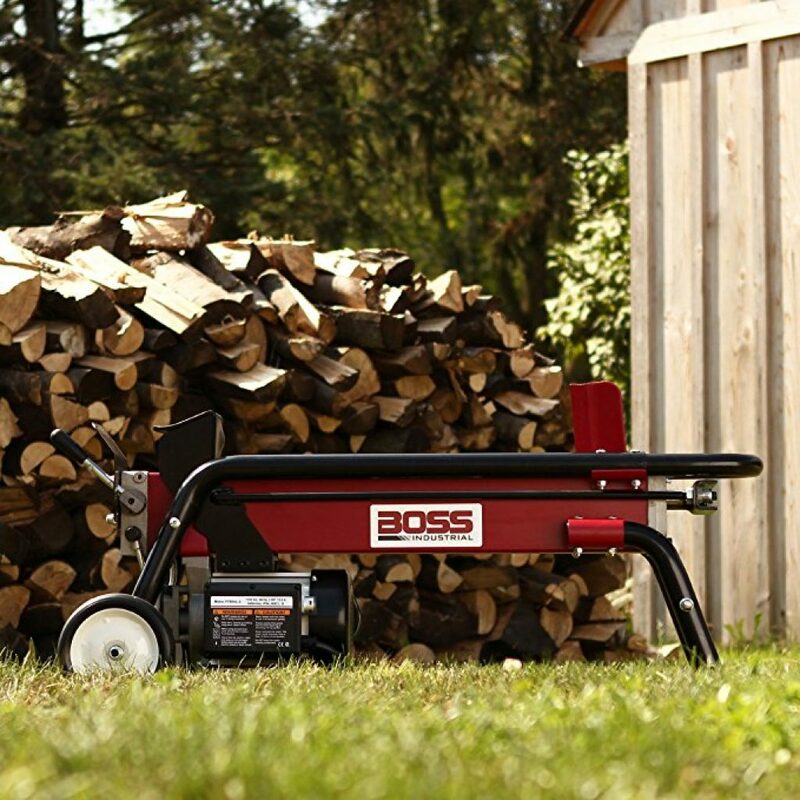 It’s surprisingly cost-effective for a log splitter with an incredibly powerful 83cc engine. While its cycle time of 20 seconds is not the best, it has other performance and convenience features that totally compensate for this. For instance, the horizontal, low profile provides for easy and quick loading of some of the heaviest logs on the cradle. Plus, it has rugged wheels to allow for hassle-free transportation and each purchase accords you a 24-month limited warranty and a lifetime technical support. There is every advantage to going with the Dirty Hand Tools 100450 as far as log splitting goes. There are downsides, of course, but only one stands out so let's begin with that. The log splitter, compared to several other models featuring on this list, comes with a premium price tag, which, in our opinion, is both reasonable and justifiable considering its off-the-charts performance and exceptional strength. The construction quality also may not stand up to rigorous log splitting projects, so if you have tough, knotted and high gnarled logs in your backyard, you may want to consider more robust alternative on this list. The positive, on the other hand, include the aforementioned remarkable 15 to 25 tons of splitting strength and a mind-blowingly quick cycle time of 9 seconds. Plus, it splits wood quickly, easily, and reliably and easy hooks to a tractor’s 3-point hitch for hassle transportation. With the Dirty Hand Tools 100450 at your disposal, the days of dragging a heavy power cord, or messily mixing oil and gasoline while discharging harmful fumes into the atmosphere, or having to worry about your battery running out are long gone. You get the confidence and peace of mind to work tirelessly and accurately all day long without wasting a single minute. There is no risk of it falling on your or other logs while working as it has a sturdy stand to ensure stability during heavy use. The stand ensures practicality in spite of the machine having low ground clearance. As a result, the manufacturer, and common sense, recommend that you exercise a little caution while hauling it over uneven or rough terrain. The high-tread wheels won't let you down, though. Irrespective of the ground you want to clear, they'll work hard to get you there in time and with minimal problems. The construction quality, on a different note, is exceptional seeing as it incorporates an 8-inch high heat treated wedge. While it cedes ground to other top-model log splitters with respect to construction quality, it's no slouch when it comes to performance. The machine boasts an incredible cycle time ranging from between 9 and 15 seconds, meaning that it powers effortlessly, quickly and majestically through the toughest logs. Factors into the equation the robust log cradle and auto-return function and you have yourself a log splitter that easily and conveniently loads and off-loads logs. The result is effortless, quick, and hassle-free splitting of logs, which makes it a solid choice for users who want that trouble-free and straightforward performance. We're not sure we mentioned this earlier or not, but the 100450 is capable of splitting wood both in a vertical and horizontal position. Switching between the two splitting positions is as easy as pulling a pin and pivoting the log splitter. Whichever position you find most convenient, go for it. However, the base plate is not sufficiently large or big to safely or comfortably accommodate large logs as there is always an imminent risk of large logs slipping. Mechanically savvy people can easily rectify the problem by fashioning something to replace the base plate, but those of us who're disinclined will have to live with the downside. With a splitting force of up to 25 tons, this option is one of the best log splitters for the money. It hooks easily and quickly to a tractor's 3-point hitch for easy transportation from one place to another. You can easily vary the cycle time as the power range is also variable. The dual vertical and horizontal operation mode makes splitting additionally easy and quick, and it easily accommodates large hardwoods and softwoods. If you need a splitter that pairs nicely with your tractor's hydraulic supply, and one that easy and convenient to use, we recommend going with the Dirty Hand Tools 100450. From one end to the other, the log splitter sports a robust and forceful construction quality; the kind that doesn't hesitate slightly when going through those dense, knotted and gnarled logs that your axe and maul just can't handle. Two of its most unique selling points are the robust handles and high-performance motor that together, enable you clear a backlog in no time at all. You're already hooked, right? Keep reading for a comprehensive review of the log splitter though, to find out more. Using it requires minimal to no effort at all on your part. The handles feature a heavy gauge welded steel construction in a design that leaves nothing to chance. The same goes for the entire frame of the log splitter. It reeks of high-end sophistication that aims at one main objective: to give the user the best experience when splitting and to take away all the effort and time and frustration that characterize using an axe out of the process. The log splitter weighs 100 pounds and physical dimensions of 37.5 inches by 11.5 inches by 18 inches. While these dimensions do not make it intimidating to move around, it is a downright energy draining process for someone who’s spent several hours splitting the heaviest and toughest woods. Consequently, to make portability a breeze, the machine incorporates a pair of heavy-tread, never-flat 5-inch wheels which, coupled with the rubber-grip handles, make transportation and portability a breeze. There will be no more bringing heavy logs to the splitter. Instead, you’ll be easily and quickly manoeuvring the log splitter to where the logs are. Only a handful of manufacturer put a lot of thought into the performance of their machines. Most try to cut down on these to keep costs down. Lucky for you, the log splitter comes with a powerful 2 HP 15-amp motor for effortlessly and reliably powering the 15.5-inch ram to ensure you accurately and evenly split all types of logs that cross your path. The cradle, for its part, has a generous space allocation capable of accommodating logs as long as 20.5 inches and as wide as 10 inches. The Wen 56206 packs a durable and sturdy wide-set log guide and a steel push plate that ensure you finish the log splitting process in no time at all. Chances of your hands coming in the path of the machine's 12,000 pounds of force are very minimal as the Wen goes to a great length to keep you safe. It's impossible to operate it with just one hand as this increases the risk of your free hand wandering into the wrong path. The log splitter requires both hands to run. Because it's electric, the machine is also safe to use indoors. It does not produce any dangerous fumes and is not a threat to the environment like gas-powered models are. Running and maintaining it is also a lot easier. Once set up and connected to a power outlet, you simply turn it on and the push plate and ram take over, pushing the logs into the wedge that wastes no time in swiftly and effortlessly splitting them without producing any toxic fumes. A significant consideration for users shopping for log splitters is warranty. With the Wen 56206 you get to enjoy a generous 24-month warranty in addition to a national network of competent customer service representatives. In case you encounter any performance or related issues, customer support is only a call away and it is a much cheaper alternative to seeking professional advice from the nearest store. It offers the user nothing short of exceptional performance. It splits heavy logs that are up to 20.5 inches in length and 10-inches in width, no matter how knotted, gnarled or tough they are. Its performance is smooth, quiet and reliable and is, therefore, a solid choice for users in need of trouble-free and hassle-free performance. Plus, it comes with 24-months warranty and pocket-friendly price tag. One of the best log splitters that effortlessly stands out from a crowded and fiercely competitive field is the SLS20825. The rugged and long-lasting construction allows it to withstand heavy, rigorous use and will provide you with years of smooth, trouble-free splitting, meaning it’s a worthy investment. Couple the high-quality construction with the machine’s ruggedness, portability, impressive cycle time and the its heat treated wedge and you have yourself a log splitter that easily accommodates and easily splits the biggest and toughest logs. With its 25 ton splitting force, not even the most knotted, densest, and gnarled logs can put up a formidable challenge. It is the exact opposite of lethargic when it comes to performance. The machine packs an impressively powerful and high-performance 280cc OHV engine that together with the heat treated and durable wedge and sturdy frame of the wood splitter makes quick and short work of the toughest logs. Irrespective of how rugged the conditions are, the log splitter consistently, smoothly and easily delivers a splitting force of up to 25 ton. To this add the ability of the 8-inch heat treated splitting wedge to easily accommodate logs that are as big as 26-inches in length and 30-inches in diameter. Compared to the rest of the log splitters featuring on this list, the SLS20825 is the only one with such a high cutting capacity. However awkward, heavy or knotted your logs are, the splitter powers effortlessly and gracefully through them like it was cutting through a piece of cake with a hot knife. 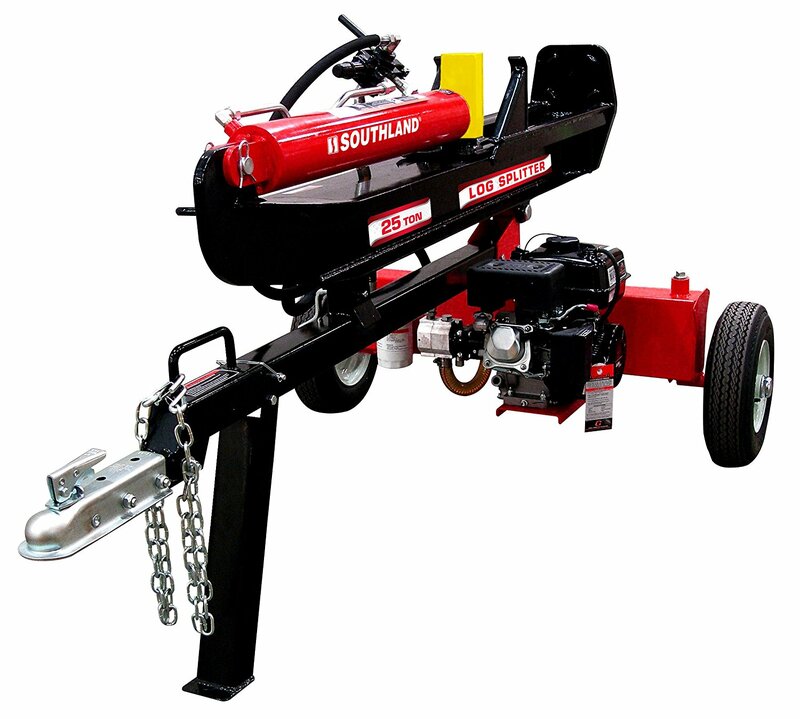 It also offers the user dual cutting modes, horizontal and vertical, which conveniently eliminates the need for lifting the heavy and rugged logs onto the high bed. You'll quickly run out of big and heavy logs in your attempt to slow down or even stop the log splitter from performing so exceptionally, and that is not helped by the fact that it features a spectacular 17-second cycle time. If you have a yard full of heavy and tough logs to split, you'll be done in just a few hours and with minimal effort and time investment on your part. The engine starts consistently and effortlessly and most of the time, at the first attempt, which is more than we can say for other gas-powered models on the market. Once you get it started, it runs smoothly and quietly; there are no violent vibrations or excessive noises that would otherwise warrant using ear plugs. Using it is quite the pleasure that comes with a peace of mind and confidence to split logs for as long as it takes. It’s a good thing the SLS20825 features high-quality construction and has a high-end heat treated wedge as the two factors guarantee you more than a lifetime of use. Moving a large and bulky log splitter is an onerous and nerve-wreaking task, which, most of the time forces the users to carry the heavy logs to the machines. That's however not the case with this option. In spite of weighing a heavy 474 pounds, the log splitter comes with this pair of heavy-duty 16-inch pneumatic D.O.T. wheels that provide for easy and quick movement over all types of terrain. 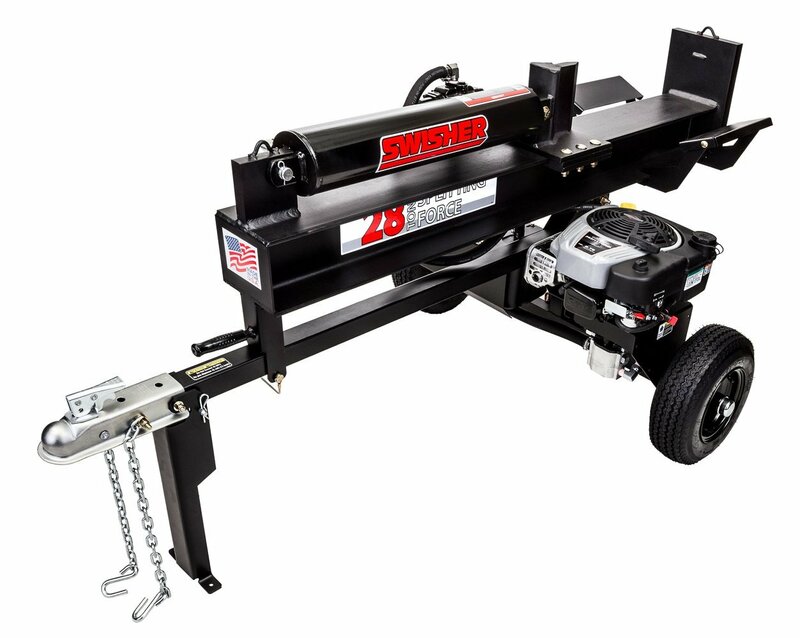 The wheels are capable of reaching speeds of up to 50 mph, meaning that in spite of the rugged durability, strength, and weight of the log splitter, you can tow it around quickly and with ease using the pre-installed 2-inch ball and coupler hitch. Fret not if you're not mechanically or technologically savvy because assembling it and having it up and running really does not take much effort or time. The manufacturer thoughtfully provides easily comprehensible instructions to diligently walk you through the few steps, which spares you extra expense of calling for professional assistance. Also, the steel frame, engine, and the hydraulics each have generous warranties of 3, 2, and 1 year respectively. Customer support, of course, is for a lifetime. Finding a log splitter that can live up to the performance and durability expectations of the user is usually quite a challenge. Even the proliferation and subsequent ubiquitousness of log splitters on the market can't stop the SLS20825 from standing out. The gas-powered unit packs incredible power for quickly splitting the toughest and most knotted logs quickly and effortlessly, thanks to its 25-ton splitting force and the 8-inch heat treated splitting wedge. It's an affordable, easy to use, high performance and durable choice for users in need of a reliable way of splitting the largest, toughest and heavy logs on the go. 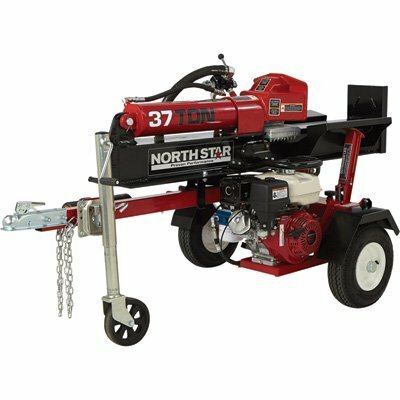 If you’re looking for a commercial grade, heavy-duty log splitter sporting all the bells and whistles to make log splitting a quick, effortless and comfortable affair, look no further than the NorthStar Horizontal/Vertical splitter. It works exactly as advertised, easily generating a splitting force of up to 37 tons. To this add the fact that it comes with a high-performance engine and a durable hydraulic pump for quick and effortless splitting of the most gnarled and knotted logs vertically and horizontally. It also boasts an efficient design that idles and regulates pressure in-between uses, thereby helping you save on energy and fuel. If we were you, combining desperately through the Internet for a heavy-duty log splitter that can comfortably and confidently handle the rigorous work of splitting large, knotty and awkward logs, we would drop everything else and order the NorthStar without blinking an eye. Do it now. We’ll tell you why in next few paragraphs. Like the vast majority of gas-powered log splitters, the NorthStar also packs an incredible amount of power. It’s capable of supplying the user with up to 37 tons of splitting force or the equivalent of 3,500 pounds of force per square inch. As a consequence, it makes short and quick work of the toughest and most knotted hickory, oak, and even beach without as much as lifting a finger, figuratively, of course. A second highlight is the dual operation mode. You can choose to use the log splitter either horizontally or vertically in accordance with the density or awkwardness of the log you want to split. The machine, therefore, qualifies as a versatile choice that aims to make your work easy and efficient. Switching between horizontal and vertical splitting positions is a rather effortless and easy endeavour. The pivot is also self-levelling to ensure the split properly aligns or stays even as you switch from one splitting position to another. The wedge is one of the most critical parts of a log splitter, and the construction quality and this machine's wedge easily withstands the rigorous task of splitting logs of varying toughness and sizes. It features an all-steel construction that gives it requisite industrial strength and ruggedness to accommodate the largest and toughest hickories, oaks and beeches without the risk of it breaking in the middle of an operation. We’re yet to find any logs the NorthStar could not handle. Its incredible power allows it to accommodate any log that’s up to 25 inches in length and 16 inches in width, splitting it quickly and with graceful ease. Setting it up in a vertical position enables you to quickly roll the heaviest and awkward logs to the low profile base without you risking throwing your back out attempting to lift them onto a raised bed. The thoughtful design helps you do an efficient job while saving you both time and effort. Like we briefly mentioned in the introductory part of this brief, the NorthStar uses an energy efficient Honda engine that automatically enters idle mode in between uses. The result is considerably less toxic gas emissions, minimal tear and wear, and helps you conserve gas and oil. The mode similarly reduces incidences of overheating and significantly reduces noise, while the pump simultaneously regulates pressure to minimal resistance. And cleaning out tough pieces of wooded that get stuck in the machine’s log is now much easier with the included automatic log stripper. The days of shutting down the machine to do the cleaning manually are now long gone. The review can never be complete without a brief description of its build quality. Every nook and cranny of the log splitter reeks of high quality, robust construction. There is little doubt it will withstand the demanding and challenging task of cutting through large and heavy logs. To this add the high centre of gravity that guarantees stability and minimal risk of it tipping over. However, you'll spend a few hours setting up the machine, which can sometimes get frustrating considering that some log splitters arrive ready to go. The reward for your patience though is spectacular ease of use, power, strength, and speed. If you were looking for a solid reason for purchasing the NorthStar, we hope we’ve provided you with several. You get to sample a splitting force of 37 tons, which is honestly more than you need even if you have the toughest logs with several knots. There is an automatic log stripper that keeps your work area clear of stuck pieces of wood or logs. The dual operational mode and the concentric hydraulic pump make it a versatile choice and help you save time and effort. If you have a keen eye for practicality, durability, high performance and functionality, then there is no way your radar will miss this affordable and reliable log splitter. For everyday splitting of logs and other wood pieces around the house, there is no need pouring lots of money on a log splitter with high-end features and specs. You simply need a functional and practical alternative with minimal bells and whistles. And in that respect, we can’t think of anything better than the Pow' R' Kraft 65556. The 4-ton machine has a knack for cutting effortlessly through logs of wood in a fraction of the time it takes most cheap, off-brand models on the market. Another unique selling point of the log splitter and one that hugely endears it to the vast majority of homeowners and enthusiastic DIYers is the sturdy construction. Plus, it's easy to use and runs very quietly in spite of being a powered log splitter. Running and maintaining it is a cinch. The machine comes with an energy efficient and dependable 15-amp, 1.75-HP motor that runs efficiently on just 1,500-watts of electricity and therefore won’t strain you financially with heavy electrical bills at the end of the month. That is not to say it cannot hold a candle to the top-model log splitters on this model, as you will soon discover. Considering that thesplitter runs on regular household current that occasionally fluctuates, the manufacturer thoughtfully incorporates a useful ground fault breaker to provide additional protection against overload. It's a safety measure that prevents fatal damage to the machine in addition to keeping the user safe and sound during log splitting. As indicated earlier, it stacks up pretty nicely against top-of-the-line log splitters on the subject of performance. The powerful motor easily generates up to 4 tons of force that provides for the quick and effortless splitting of average-sized logs around the house. While the power is not ideal for splitting those tough and knotted logs found on the bed floor of the forest, it can struggle to go through such, But the result won’t as impressive as it with its top-end counterparts. Nevertheless, the consistency and safety of its cutting motion enable it to easily handle logs that are up to 20 inches in length and 10 inches in diameter. One aspect that hugely helps it accomplish the fete is the sturdy and rugged construction using high-quality, durable yet lightweight steel. As a consequence, it gracefully stands up to the rigorous task of splitting logs without a single hitch or glitch in performance. With the reverse and forward cycle times standing at 8 and 7 seconds, respectively, the Pow' R' Kraft 65556 has more than what it takes to split seasoned woods into usable pieces easily. Note that its cycle time easily overshadows those of some of the high-end log splitters on the list. On a different note, the ergonomic design of handles aims to make using it a cinch, so you don't expend unnecessarily too much time and effort on your splitting tasks. The handles cushion the hands and prevent hand fatigue or strain when working the machine. Also, the machine has these sturdy and durable wheels that help with portability and manoeuvrability which is especially important considering that it weighs some 105 pounds. The most glaring downside, and quite a petty one at that is the two-handed operation. You can't operate the machine with just one hand. The idea is to keep you safe, but then again, it monopolizes your time. Also, being an electric model, you will be dragging a power cord behind you every time you go wood splitting. We find that the 24-month warranty more than compensates for these two minor drawbacks. The performance of the Pow' R' Kraft 65556is, in a word, outstanding. While it does not come cheaply, it makes quick and light work of virtually every log you through in its path, with the notable exception of green and very knotty sections of wood. Still, if you're in search of a powerful, strong, and versatile log splitter, there is nothing to stop you from going with this option. With premium pricing comes a beast-like performance, and this observation is especially true for our final log splitter, the Swisher LSRB87528 28-Ton. However, the high asking price is again, in our opinion, totally commensurate with the performance, durability, practicality, usability, portability and high-end construction of the log splitter. The splitting force, for instance, stands at an impressive 28 tons, patently one of the highest both on the market and on this list. By implication, the log splitter packs more than enough power to cut effortlessly and quickly, without the slightest hesitation or hitch, through the toughest, gnarled and knotted logs you throw in its path. It has sturdy wheels to allow for easy and quick towing over all types of terrains and is a versatile choice that splits logs both horizontally and vertically. The performance of the Swisher is not in question. 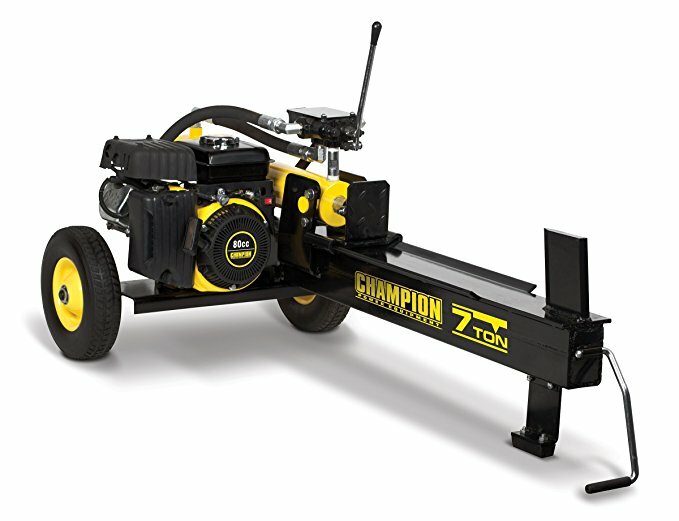 The machine packs a powerful 8.75 Gross Torque Briggs & Stratton engine that works reliably and smoothly and with minimal noise and vibrations, irrespective of the size of logs it is splitting. Additionally, it generates a cutting force of up to 28 tons, more than enough to allow you finish cutting through differently sized logs in a fraction of the time it would take cheap, off-brand models cluttering the market. So powerful is the log splitter that splits through heavily knotty cross grains like they were a toothpick. The log splitter also allows you to work conveniently and efficiently by offering you dual operation mode. You can choose between the horizontal and vertical cutting positions depending on how tough, heavy, or knotted your log is. Finding such convenience and flexibility with cheap electric, hydraulic, or manual log splitter is just difficult, and when you, the performance will pale in comparison with that of the LSRB87528. The log splitter has a cycle time of 14 seconds. It’s not the fastest the market has to offer but what it cedes in speed it more than makes up for strength. It starts on the first attempt and reliably so for a gas-powered log splitter. Aside from performance, it also has several convenience features that make those of other log splitters pale into insignificance. The features aim to save time and effort and to make the otherwise onerous task an enjoyable affair. There is, for one, the aforementioned dual operation mode that allows you to split logs in vertical and horizontal positions. Secondly, you to stay safe and in one piece during splitting, thanks to the vertical beam lock. Another pleasant surprise is the comfortable position of the log cradle that eliminates the need for bending down every so often. It enhances comfort and ease of use by eliminating back and shoulder strain. Also, itcomes with a pair of sturdy and long-lasting wheels to make manoeuvrability and transportation on the highway a breeze. With a high-performance 6 HP motor that easily attains maximum speeds of 3600 rotations per minute, generating a splitting force of up to 28 tons in the process, there is no log that it can't quickly, efficiently and easily split. It features heavy-duty construction to comfortably withstand the rigors of the job for several years to come. The cycle time is not very fast but the power and strength pretty much make up for it. 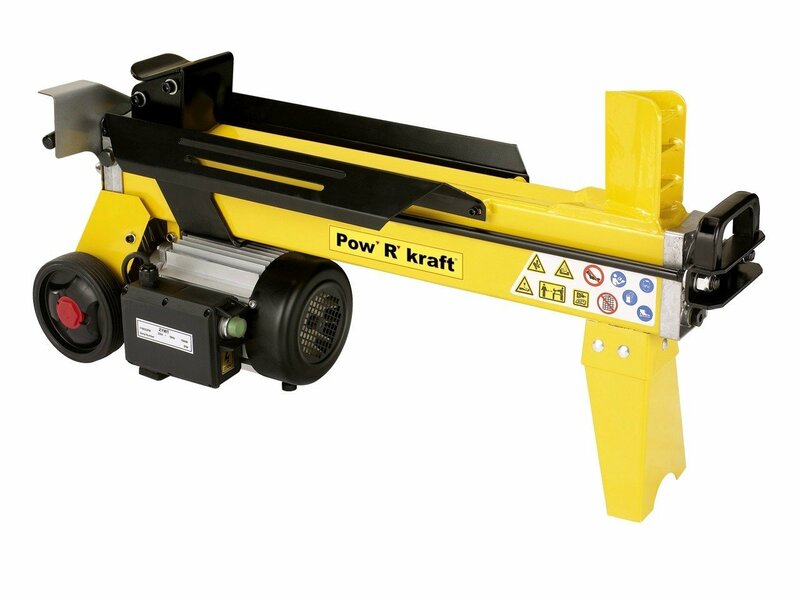 The machine easily accommodates logs that are up to 24 inches long either in a vertical or horizontal position. However, at 404 pounds, it is one of the heaviest splitters on the list but is towable and sports two heavy-duty wheels for effortless transportation and manoeuvrability. Log splitters come in one of two orientations: horizontal or vertical. This variance in design accounts for significant performance and usability difference. Vertical log splitters can work just as efficiently even when there are space constraints. Additionally, they pack considerably more power meaning that they exhibit more effortless and quick performance when it comes to splitting large, tough, and awkward logs. They, however, can’t hold a candle to their horizontal counterparts when it comes to mobility and stability. On rough and uneven terrain, the user will have to put in extra effort in ensuring they are sufficiently stable before loading logs. Therefore, in general, they are the preserve of small and large companies and other commercial engagements. If you’re looking for a log splitter to use around the house, the horizontal design comes highly recommended. They have the same functionality but are much safer and easier to operate and maintain. Cycle time is an accurate determination of the efficiency and speed of a log splitter. The amount of time it takes for the ram to do the split and return to its original position constitutes the cycle time. It goes without saying that the faster the cycle time, the more logs you’ll be able to split within a given time frame compared to a machine with slower cycle time. Keep in mind that high-end log splitters with remarkable tonnage don’t necessarily have the fastest cycle times. For domestic use, anything with a cycle time in the neighbourhoods of 15 seconds should suffice. For commercial applications, however, look for a model that perfectly balances cycle time and tonnage to get the best experience. Smaller and more efficient log splitters will take considerably shorter time than their bigger but equally efficiently counterparts. You can never discount the significance of safety and security when you’re operating power tools like log splitters, especially in light of their fast moving parts. To ensure you finish your splitting in one piece, make a point of religiously checking the safety features your preferred model offers before you finalize your purchase. Features like automatic stop ensure the machine doesn’t dismember your hand as it splits. Dual-hand operation guarantees that none of your fingers or hands wander into the path of fast moving parts like the ram if you let your guide down. Also, units with an overload reset button or protection can avoid fatal electrical damage in case of fluctuations in electrical supply. These are features that are hard to come by unless, of course, you have the wherewithal to stick to brand names. The splitting force of your log splitter will greatly determine how fast you’ll be finishing your projects. However, it would be prudent to choose the tonnage in accordance with the heaviness or toughness of logs you intend to split, so you don’t end up throwing lots of money on a high-performance machine only to use it on softwoods. For domestic applications, anything between 4 and 15 should be more than sufficient to help cut down on time and effort you’d otherwise you with an axe or a maul. Q: Are there any major differences between electric and gas log splitters with respect to performance and convenience? A: There are minimal differences between the electric and gas-powered log splitters on the market. They both pack an incredible amount of power, and they both perform with a speed and efficiency that traditional axes and mauls just can’t match. Concerning convenience, electric models don’t pose any risks to your health like gas-powered models do with their fumes. Electric models are similarly easy to run and maintain. You don’t have to thoroughly clean them, refuel, or change the oil filters every so often. That’s not to say its all gloom and doom for gas-powered log splitters. In fact, high maintenance and toxic fumes aside, gas-powered log splitters trump over their electric counterparts on several fronts. The fact that they are incredibly portable and can be used from just about anywhere as long as you bring enough fuel with you features prominently at the top of that list. Q: How big or small a log splitter will meet my needs adequately? A: That heavily depends on the size of logs you intend to split. If your logs hover anywhere near the range of 25 inches in length and 100 pounds in weight, go for a gas-powered log splitter. If on the other hand, the length of the logs doesn’t go past 20 inches, consider investing a formidable hydraulic machine. Heavy-duty splitters of any type are better suited for huge and heavy logs. Log splitters are a long-term investment and a perfect replacement for the inconvenient, time-consuming, and back-wreaking option of using the traditional axe. Choosing a most suitable model, therefore, calls for some thorough and in-depth research, all the while keeping in mind the purpose for which you’re getting the log splitter. However, avoid the temptation of splashing lots of money on a model with all the bells and whistles if you’re looking for something for domestic, light-duty to medium-duty use. Neither should you compromise by going for the run-of-the-mill models. Irrespective of your pick, ensure it’s practical, easy to use, affordable, functional and durable.